I was open-mouthed when I first saw this vessel – it conveniently highlights the modesty of the cabin I occupy aboard Blue Mistress, My boat is a little shorter than the ‘garage’ in the stern above, the owner is just over half my age. This is not primarily a post about boats but about making a small living space more conducive. When at anchor, I want a degree of ‘luxury’ – to be able to read comfortably, which means having a book shelf somewhere near at hand, and to write ‘sitting up’ at the cabin table. I think I have solved the problem, albeit quirkily, at this winter’s refit. I can manage the low headroom. I am shortish, around 5ft 8in, and, as I mentioned the other day, bodies learn. 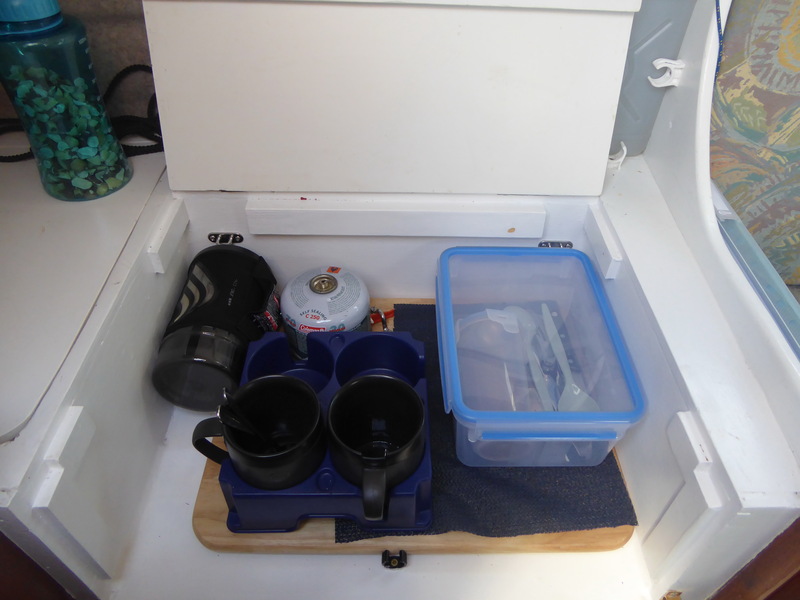 It doesn’t take long be able to move round a small space on autopilot. The sea will occasionally knock me around but there’s not far to fall. The trick with the space is to make it feel bigger than it is. 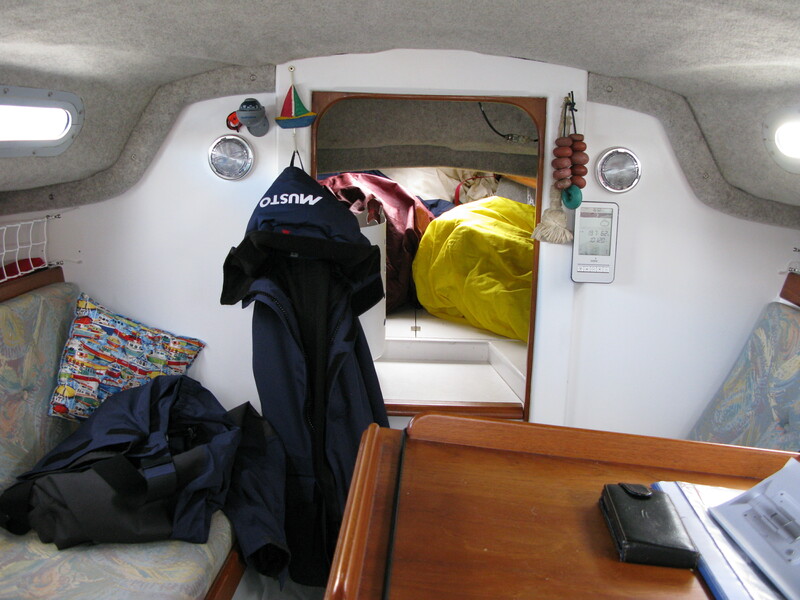 When I bought the boat, I inherited the smart cushions but the cabin was varnished. Painting it white with varnished trim made all the difference. For all but a long passage, stowage space is reasonable. There are lockers below and behind the cushions, and plenty of room, including lockers, along the quarter berths. 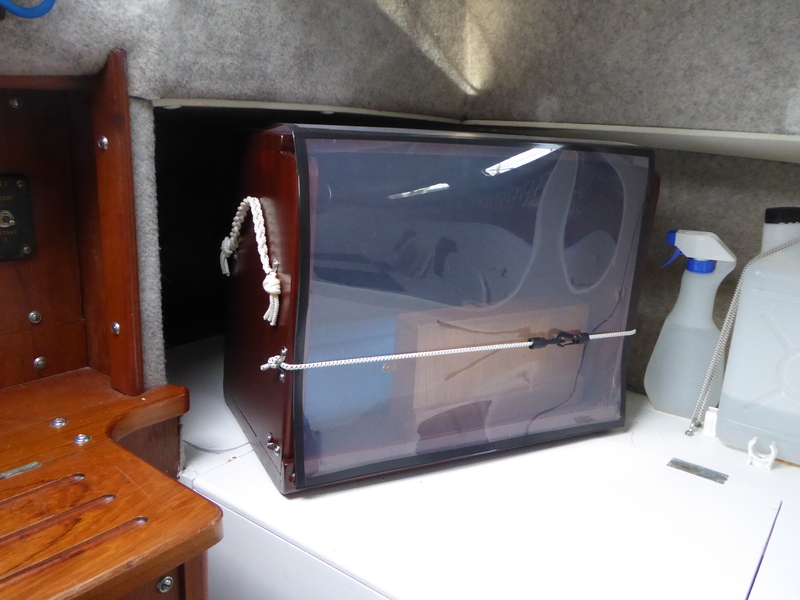 The forepeak is a reasonable size too – shown here with sail bags dropped through the hatch (and oilies slung in the corner – dry, I hope). There are eyes along the fronts of the lockers that allow gear to be lashed on the cabin sole – (currently two tool bags). If even more space is needed, there are two wide straps bolted beneath the cushions on each side. Gear, and me if necessary , can be strapped to the seats. 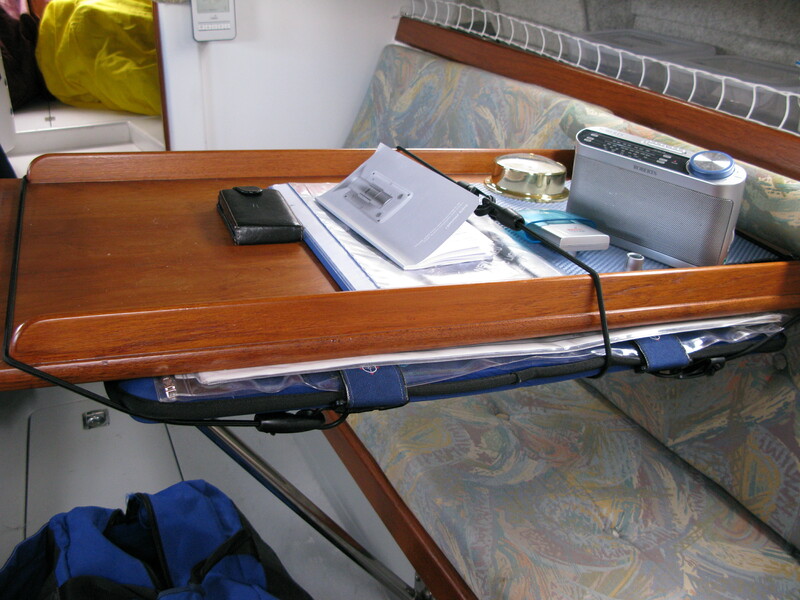 The cabin table is fitted athwartships and bolted into the starboard lockers. It’s a good table and fine for everything except sitting up and writing. I have a Yeoman chart plotter, which I use less often – (there’s so much choice now). It fits under the table, which also solves the problem of what to do with the charts. Imray charts are folded away elsewhere. The fuel tank is in a locker to starboard and the two batteries in a locker to port, both level with the engine housing. When at sea, collapsible ‘buckets’, which carry kit-that-should-be-kept-handy, are hung on large hooks just inside the companion way. So that’s the business side of the boat taken care of. Now for the luxury . . . There was nowhere to put navigation books – pilots, almanacs, instructions and so on. I had them in a plastic box tucked down a quarter berth. They are heavy and were a nuisance to reach. So I have built a removable book shelf that fits into the end of the port quarter berth. There isn’t a right-angle in it. I made it by eye, without a set-square – (don’t ask). It fits very snugly! The plastic shield provides a rough protection against splash. The box is lashed at the side and pulls out to reveal waterproof bags of spare clothing etc. The battery locker is forward of it, the galley area forward of that. The lid needs a a fiddle as it is a useful worktop. 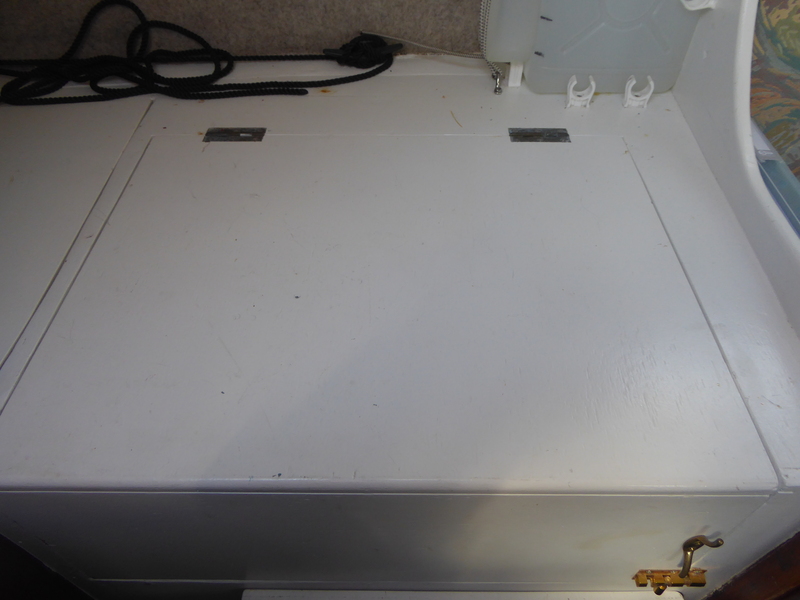 I took out the two-burner origo stove. It was a very good stove, but I didn’t need two burners and it took up space. The Jetboil is very efficient – boiling a cup of water in approximately one minute. The canister is locked on a stand bolted to the board. The whole lot can be removed. 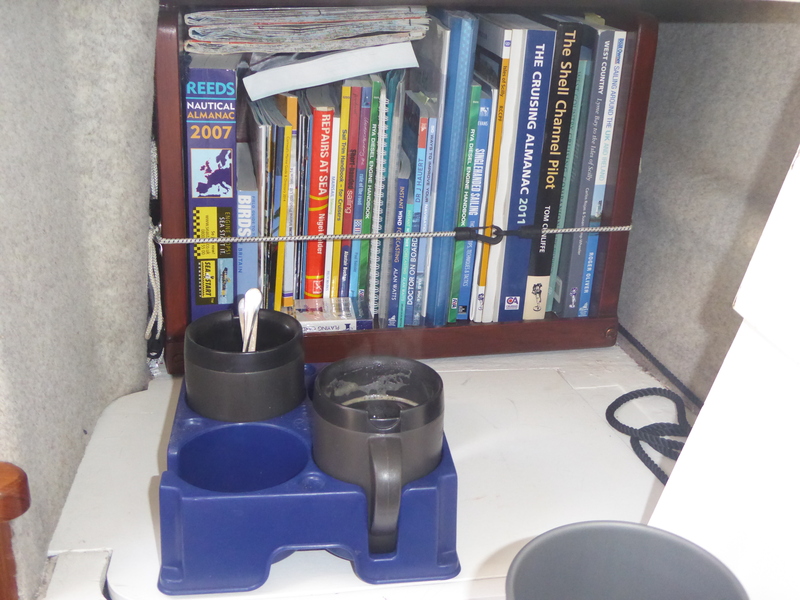 There is a small camping stove stowed in one of the lockers if I ever want the luxury of two burners while at anchor. Cooking is carried out seated on the lower companion step It is a one-cheek step but nevertheless comfortable. This is enough for now. The next post looks at the quirky answer to my sitting-up-at-the table problem. The top image was taken in Wellington Harbour, New Zealand, in April last year. 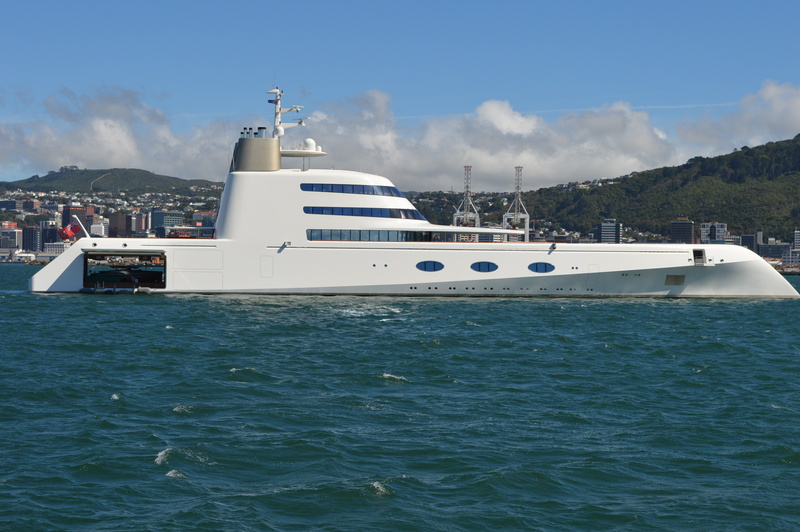 The vessel is the “A”, named after the owner’s wife. I don’t think my state room matches up.